This is Leo. Pampered. Happily unemployed. Well fed. Perfect BMI. Barely 20 in people years. Leo playing in his back yard. I’d call him the reincarnation of legendary San Francisco 49er wide receiver, Jerry Rice, but Rice is still very much alive, so Leo is just Leo the Care-free Border Collie. Leo lives in Wine Country, Northern California as opposed to me, a long-time resident of Whine Country, New York. Since the country is going to the dogs, Leo is my American Idol. 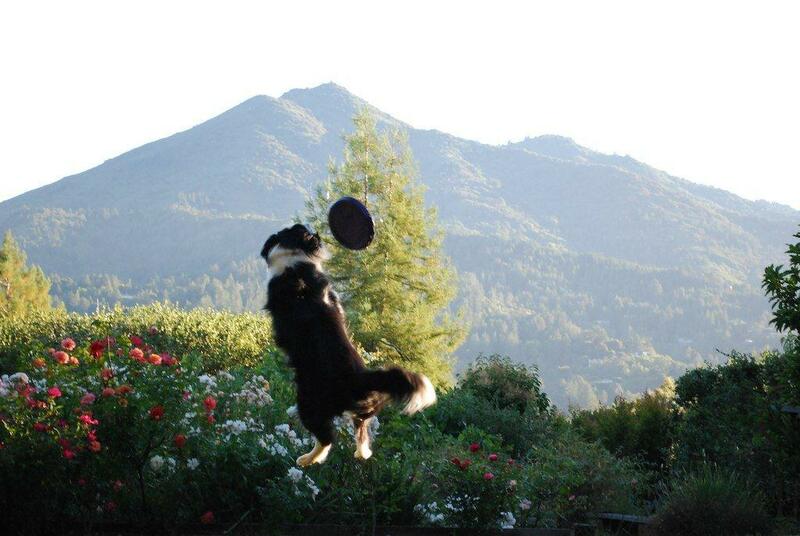 This entry was posted in Humor and tagged border collie, jerry rice, san francisco 49ers, wine country. Bookmark the permalink. Inspiring! We can learn from this guy. And Leo did make the catch! Thanks for checking in! I’d definitely like to be someone pampered and furry but with paws. I’m just two thirds of the way there in this life.